Last Week in Review: Home price gains and job growth hold steady. "Heigh-ho, heigh-ho, it's off to work we go." The Seven Dwarfs. A strengthening jobs market and low home rates are digging up demand for limited housing inventory. Meanwhile, home price gains hold steady. 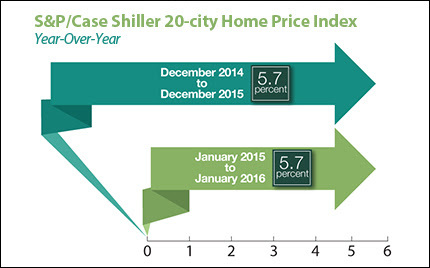 The S&P/Case-Shiller 20-city Home Price Index rose 5.7 percent year-over-year from January 2015 to January 2016. This was in line with estimates and matched December's 5.7 percent gain. Prices were up 0.8 percent month-over-month. The low inventory of homes available for sale has been the key reason for price growth; more Americans working also has fueled demand. To go one step further, a red "candle" means that MBS worsened during the day, while a green "candle" means MBS improved during the day. Depending on how dramatic the changes are on any given day, this can cause rate changes throughout the day, as well as on the rate sheets we start with each morning. 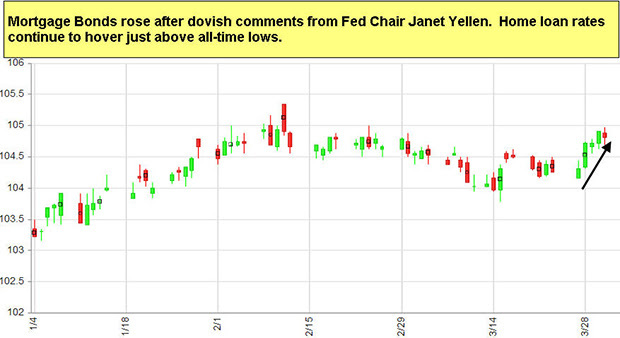 As you can see in the chart below, Bond prices moved higher recently following remarks by the Fed.